This chapter is not a Mediawiki Tutorial. It focuses on the integration of Mediawiki with Tuleap. If you are not familiar with Mediawiki we warmly advise you to first read some of the documents listed in the references section (see Mediawiki References). The Mediawiki version provided by Tuleap is 1.23. There is one instance of Mediawiki per project. Tuleap manages the connection to Mediawiki. Tuleap users have access to the Mediawiki service in any project they are allowed to access (and which has activated the service), so you don’t need to register on Mediawiki. Restricted users will have access to Mediawiki from projects they are members of. If they aren’t, they won’t be able to access Mediawiki neither from public nor from private projects. Note intended for long time Mediawiki users. Contrary to default Mediawiki, in Tuleap ‘anonymous’ users can only Read pages (they cannot create or edit). 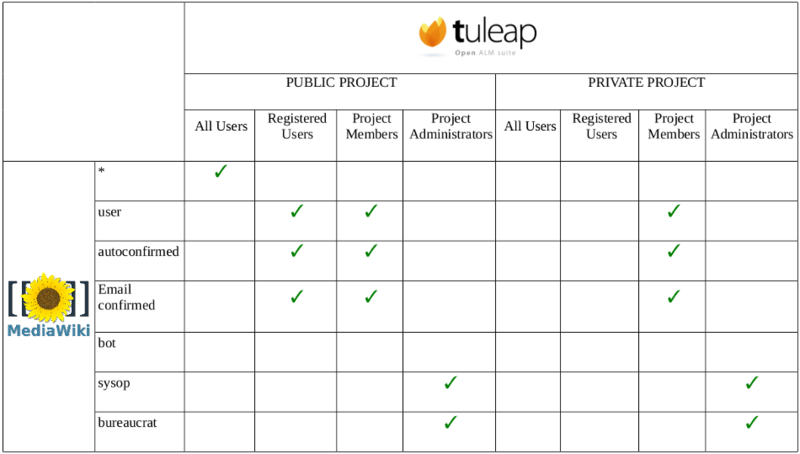 As of today, when you have a public Tuleap project, you cannot prevent anonymous users from browsing the pages. If you need to have a private Mediawiki, then you should switch your project to Private. There is a default mapping between Tuleap and Mediawiki default user groups. Users added in Tuleap groups will be automatically added in corresponding Mediawiki groups. It is no longer possible to add users in Mediawiki groups directly from Mediawiki. For instance, when a new user is added to a project, he/she will be added in the user, autoconfirmed and email confirmed Mediawiki groups. This is fully transparent for both users and project adminstrators, and there currently is no way to create a custom mapping from the Mediawiki service. 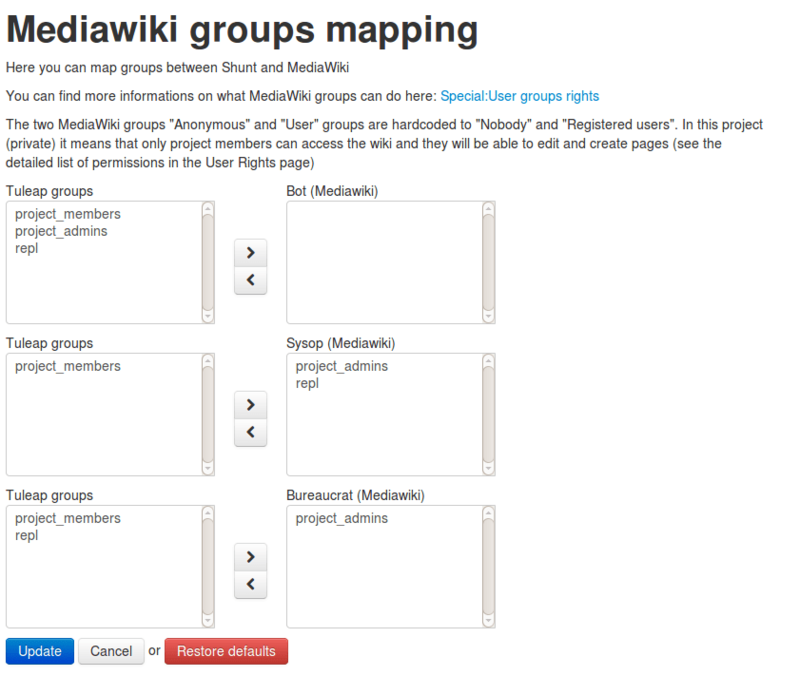 As a project admin you can also define your own mapping between Tuleap and Mediawiki groups. Please note that it’s not possible to assign Tuleap special all_users and registered_users to Mediawiki groups. CategoryTree : dynamically browses the structure of categories. For more information about this, please visit the project’s mediawiki, click on Special Pages, then on Version to access the list of installed extensions. Cite : adds <ref[name="id"]> and <references/> tags for references and footnotes. ImageMap : allows for client-side clickable images, thanks to the <imagemap> tag. InputBox : allows for the inclusion of predefined HTML forms. LabeledSectionTransclusion : adds the #lst and #lstx functions and the <section> tag, and activates the marked sections in the text that must be transcluded. ParserFunctions : enhances the wikitext parser throught the addition of logical and strings manipulation functions. PdfBook : lets you compose a book from articles in a category and export it as PDF. SyntaxHighlight_GeSHi : allows for source code syntax highlighting throught the <syntaxhighlight> tag and the GeSHi syntax highlighting. WikiEditor : provides a text editor. Only available when display is ‘Compatibility view’ mode (see below). Math: provides support for rendering mathematical formulae. You can find usage examples on Wikipedia. This extension might not be enabled on your Tuleap instance, contact your Tuleap administrator to enable it (see activate the Math extensio). TuleapArtLinks: provides artifact links integration with Tuleap. Since Tuleap 7.10, MediaWiki recognizes Tuleap cross-references such as art #12345 and turns them automatically into hypertext links pointing to the corresponding Tuleap artifact. In order to accommodate for mediawiki plugins that are not compatible with Tuleap’s window rendering there is an option to enable a compatibility view. If checked and if the site administrators have set it up then the mediawiki in that project will take a standalone appearance. There will be links on the sidebar that will bring you back to your project area. The logo must be named .wgLogo.png exactly (notice the dot prefix). It must be located in /var/lib/tuleap/mediawiki/projects/<project-id>/images/. Ask your site administrators to upload it there for you. Its height and width should be 155px x 155px but can be smaller or larger, as it will always be adapted to these dimensions. CategoryTree contributed by Daniel Kinzler. Cite contributed by Ævar Arnfjörð Bjarmason. ImageMap contributed by Tim Starling. InputBox contributed by Erik Moeller, Leonardo Pimenta, Rob Church, Trevor Parscal and DaSch. LabeledSectionTransclusion contributed by Steve Sanbeg. ParserFunctions contributed by Tim Starling, Robert Rohde, Ross McClure and Juraj Simlovic. PdfBook contributed by Aran Dunkley. SyntaxHighlight_GeSHi contributed by Brion Vibber, Tim Starling, Rob Church and Niklas Laxström. TuleapArtLinks contributed by Enalean SAS.